Folks, I have two exciting contests today – one that’s brand new, and one that I’ve been running for a few months now. They’re both on facebook, so please do check out the links to my facebook page. 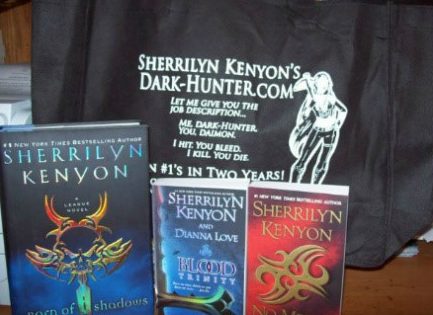 The first is a fantastic Sherrilyn Kenyon prize pack, which includes a gift tote, a hardcover copy of Born of Shadows, and paperback copies of No Mercy and Blood Trinity! I’ll be giving away three of those packs, so pretty good odds for this baby! Click HERE to enter now. The second contest involves the chance to win the entire signed backlist of some of your favorite authors, including Lisa Kleypas and Julia Quinn. Five huge romance fans who just happen to be romance authors as well have decided that we want to give you the opportunity to receive complete, SIGNED backlists of one of your very favorite authors (and yes, that means EVERYTHING they’ve ever written). The romance fans/authors who are participating are: Ashley March, Shana Galen, Lila DiPasqua, Heather Snow, and moi, Vanessa Kelly. Before we can give these awesome prizes away, though, we need you to show how fanatical of fans you are. Since we know that you’re already following The Amazing Authors on Facebook (you are, aren’t you?? ), all you need to do is follow the authors who want to give away these complete, signed backlists to you. We all have to reach a certain number of followers; once that happens, then we will run a Facebook giveaway on our individual pages where you can enter to win the complete, signed backlists from the Amazing Authors. Those are the rules! Tell your friends, tell your family, tell any fellow romance fan you know. Soon, 5 lucky winners will win a complete, signed backlist from a favorite author that will make you SQUEEEEE! Now get out there and start liking those pages!